The Chicago City Council Licensing Committee voted Wednesday to approve regulations on house-sharing businesses like Airbnb. The measure was approved by the committee 17-9 but will not receive a full council vote until June because several aldermen requested more time to consider additional corrections made as recently as Tuesday. Under the ordinance, renters would pay the entire 17.4 percent hotel tax, 4.5 percent of which goes to the city. An additional 4 percent surcharge would go towards a city homeless initiative. Existing licensed B&B’s would not be subjected to the additional 4 percent surcharge. Mayor Rahm Emanuel backed the plan earlier this month. There is also a proposed two-tiered licensing structure. Full-service list units that handle financial transactions, manage disputes and provide insurance, like Airbnb, would not require licensing, but would be required to register through the city. The registration would be done monthly, although people listing more than one unit would be required to obtain a shared housing unit’s operator’s license. Otherwise, users of services that only provide listings, like VRBO and HomeAway, would be required to obtain Vacation Rental or B&B licenses. Both registered and licensed units would be required to adhere to certain regulations that protect against building code violations, problem landlords, building code scofflaws, nuisance properties and prior suspensions, revocations or egregious conditions. The proposed ordinance also has regulations for both types of rentals that deal with how how many units can be rented through house-sharing services in specific buildings. For example, single family homes can only be rented if it is the owner’s primary residence and the owner is present for the duration of the rental. Enforcement falls under two categories. 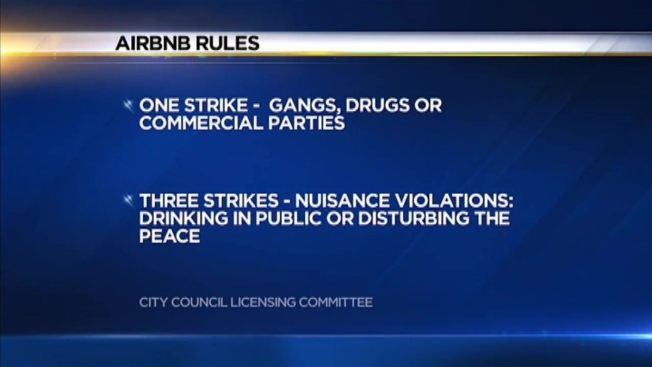 Egregious violations, including gang-related activity, drugs, violent acts and commercial parties, would fall under a “one-strike and you’re out policy.” Nuisance violations, including disturbance of peace, drinking in public and loitering would fall under a “three-strikes and you’re out” policy. Penalties for Airbnb hosts would range from $1,500 to $5,000 per violation. A vote on the house-sharing ordinance was delayed Tuesday after hundreds of people arrived at City Hall to oppose the measure, the Chicago Tribune reports.